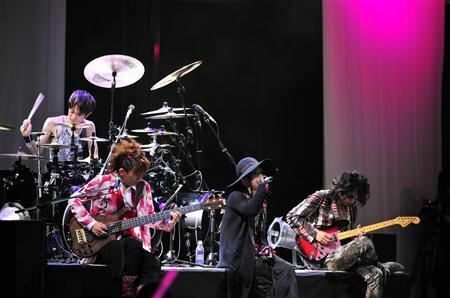 On May 31, rock band L'Arc~en~Ciel held the final performance of their world tour at the Waikiki Shell in Honolulu, Hawaii. As it's their first concert in Hawaii, the City of Honolulu established this day as 'L'Arc~en~Ciel Day'. Towards the end of the concert, the Mayor of Honolulu,�Peter Carlisle, made a surprise appearance and declared May 31, 2012 as 'L'Arc~en~Ciel Day'. Mayor Carlisle decided to make this day 'L'Arc~en~Ciel Day' to show gratitude to the band for choosing Hawaii as the last stop of their tour. The Mayor also felt they have made a great contribution to cultural activities, and built a bridge of friendship between Hawaii and Japan. After the big announcement, leader tetsuya was presented with an official statement, and the members took a commemorative photo. With this, L'Arc~en~Ciel has become the 3rd Japanese artist to establish a day of remembrance in Hawaii. 'TUBE Day' was created back on June 1st of 2000, and 'Arashi Day' was born on March 30 and 31 in 2002. Vocalist hyde expressed, "Today became an amazing day. Since this is a paradise of rainbows ('L'Arc~en~Ciel' means 'The Rainbow' in French), I'm happy." On this day, L'Arc~en~Ciel excited both local and Japanese fans by performing a�total of 21 songs, including "HONEY" and "Niji". "Since L'Arc Day has been made, I would like to hold a live here again," said hyde. Check out pictures from the concert below! Arashi reveals radio rip of coupling song "voice" from their single, "Your Eyes"